Stocks are rallying this morning as investors look at the recent pullback as an opportunity to buy some stocks while they’re “on sale” after last week’s small pullback. While we’re happy to see some strength come back into the market to buy, there’s still a feeling that the markets aren’t done with the seasonal selling pressure. Obviously, the one sector that everyone is looking at this morning is the insurance group. These stocks were pummeled over the last week as hurricanes entered the risk picture, sending investors running from these stocks. Today’s three big stock charts look at insurance companies like Chubb Ltd (NYSE:CB), Cincinnati Financial Corporation (NASDAQ:CINF) and Allstate Corp (NYSE:ALL), which took multiple rounds of selling as investors prepared their portfolios for the storm. Now, with the storms passing, two of these stocks are a buy as they scream higher from their recent bottoms, and one is worth passing on. Chubb insurance is one of the Property and Casualty companies that offers insurance and reinsurance services that provide coverage for more of the eastern United States. 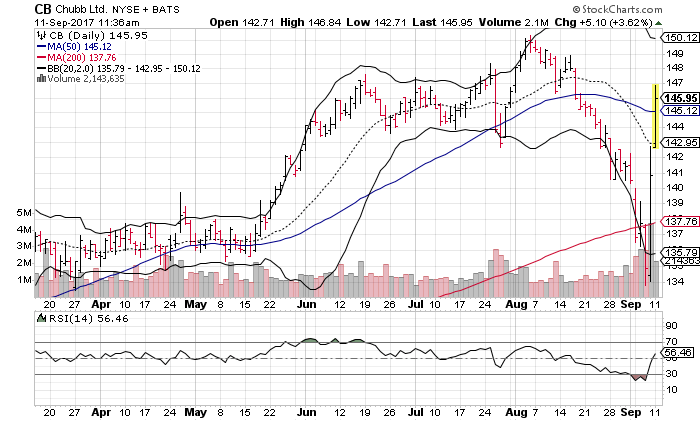 CB shares declined from $150 to $134 since their peak in early August. The stock is trading back at $146 this morning, but is it worth the effort to get into now, or has Chubb stock made its recovery already? CB is among the weaker of the three insurance companies we’re looking at today. The stock had already started transitioning into an intermediate-term bearish pattern before the hurricane season took its toll on shares. Chubb shares are roiling back from an oversold signal, their first in more than a year. The rally has CB shares cresting above their 50-day moving average, which is likely to add some overhead pressure during this week’s trading. From a longer-term perspective, Chubb stock is already testing its 10-month moving average, which adds to the intermediate- to long-term pressure on the stock. Traders will begin to feel more long-term pressure on this stock compared to its peers based on this technical weakness. Cincinnati Financial often gets pulled-down with the rest of the insurance sector, despite the fact that the majority of its liability coverage is in the central mid-west. In this case, CINF is one of the more technically sound stocks within the financial and insurance sectors, thus it presents itself as a better trading opportunity based on the recovery we should see in these companies as the storms pass. Cincinnati Financial shares were sold from traders’ portfolios, despite the fact that the company’s insurance portfolio is more focused on the mid-west. 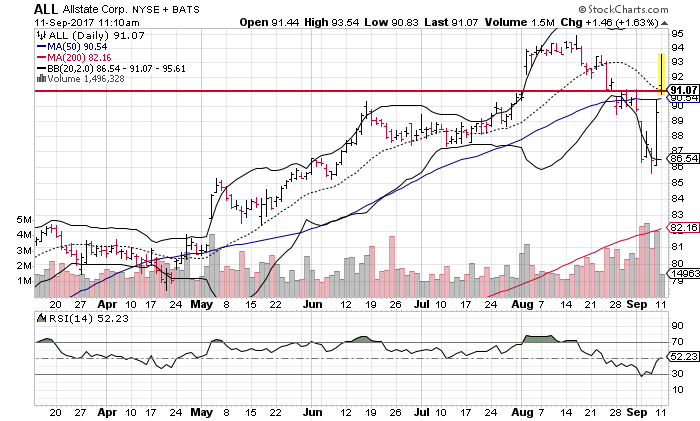 This selling provided a short-term dip in CINF based on sympathy for the sector instead of specifics of the stock. Cincinnati Financial stock continues to trade above its 50-day moving average and found support last week at its 200-day moving average. This is suggesting strength in the company that will carry it higher with its intermediate-term trends, which remain strong. 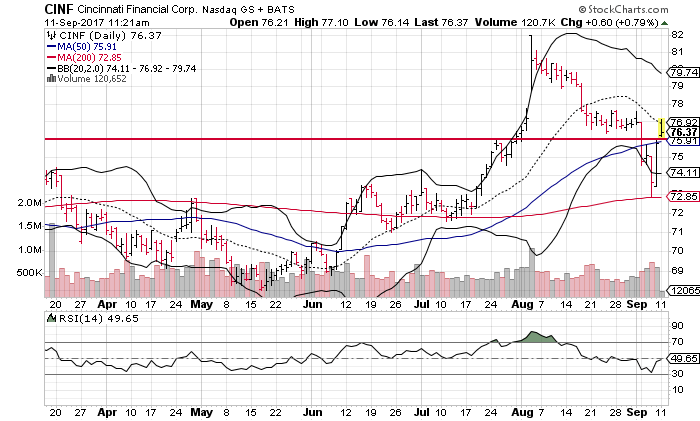 Like Allstate, discussed below, Cincinnati Financial is sitting just above price chart support at $76. This level has provided resistance and support in the past and it should be viewed as a line in the sand for the directional move that the stock will take over the next four to six weeks. Allstate shares are another within the sector that are presenting a better long-term buying opportunity to investors as the recent pullback has been contained by the intermediate-term technical support trends. We’re still likely to see increased volatility among ALL, and maybe even a better price to purchase in the short-run. That said, the market clearly oversold these shares into an attractive long-term price range. After hitting a clear oversold signal late last week, Allstate shares have rallied back above the $91-level and it still has some distance to go before the shares will work their way into overbought territory. This indicates further upside for ALL stock. The $91-price has indicated itself as strong chart support as past points of resistance and support for Allstate shares. This price should turn quickly to support and trigger buying if ALL shares retrace to that point. Allstate shares remain above their 200-day moving average, which is tracking higher. Additionally, the stock is moving back above its 50-day moving average today, which is also trending higher. This puts ALL stock right back into a short- and intermediate-term bullish outlook. As of this writing, Johnson Research Group did not hold a position in any of the aforementioned securities. Article printed from InvestorPlace Media, https://investorplace.com/2017/09/3-big-stock-charts-for-monday-chubb-ltd-cb-allstate-corp-all-and-cincinnati-financial-corporation-cinf/.